After the success of the singles ‘Aaja Hun’ & ‘Shera Varge’, HIGHFLYERS return with their highly anticipated 2nd Album… ‘BORN DESI’. In 2011, Highflyers released their self-titled Debut Album which featured the smash-hit songs ‘Baa Farke’ (feat. Late Kaka Bhainiawala), ‘The Shinda Duet’ (feat. Surinder Shinda & Maninder Shinda), ‘Daru Naal Yaari’ (feat. Late Kaka Bhainiawala) & ‘Gulabi Suit’ (feat. Meet Malkit). This album firmly introduced the Highflyers sound into the industry. For their 2nd album, Highflyers wanted a name which represented their roots and music style, the name ‘Born Desi’ was selected. Highflyers always infuse traditional elements in their music, representing their roots in each song they produce. The 14 track album is accompanied with a video for ‘The Manak Tribute’, which is a tribute to the Late Legend Kuldeep Manak Ji. A folk anthem destined to rock the dancefloor! The Track features the powerful raw vocals of PARGAT KHAN, the nephew of Kuldeep Manak, with lyrics by the legendary writer Dev Therikewala. The video was filmed in different areas of Punjab, part of which was shot on the well known GT Road, displaying a modern twist to the story told in the lyrics. The album promises to showcase a variety of different styles, while still featuring the signature Highflyers sound. It will bring a fantastic vibe to the scene and display the growth of the Highflyers (Gurj & Indie) as artists. 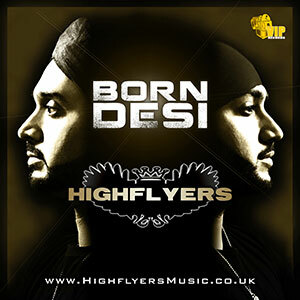 The Album ‘Born Desi’ by Highflyers will be released on 3rd April 2014 on VIP Records and will be available to purchase on iTunes, Google Play and all other trusted digital retail stores.